As a result of CARE’s pilot grant program launched in 2016, so far three new processors have begun recycling post-consumer carpet (PCC), adding millions of pounds of recycled output, 14 new California jobs and over a dozen new recycled carpet products. In the spring of 2016, CARE’s California Carpet Stewardship Program awarded approximately $2 million in grant funding for six Capital Improvement and three Product Testing projects. 85% of the grant funding was awarded to California-based projects. The grant funding supports capital investment, infrastructure and/or equipment that will process or manufacture products utilizing California-generated PCC, as well as product testing and research and development activities that investigate the use of PCC to manufacture established products, test or certify new or reformulated products and/or feasibility studies on potential new uses of PCC. Establishment of four new PCC operations and processors in California (a 200% increase in the number of California PCC facilities). 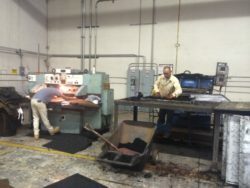 Employees of Sierra Mat & Rubber mold and press commercial mats made out of recycled California rubber and California post-consumer carpet (PCC) backing material. As of January 2017, two Capital Improvements grantees, SafePath Products (Chico, CA) and CLEAR (Lincoln, CA), have moved into their new California facilities and begun production of Tier I and Tier II (consumer) products using carpet backing, PET and polypropylene. 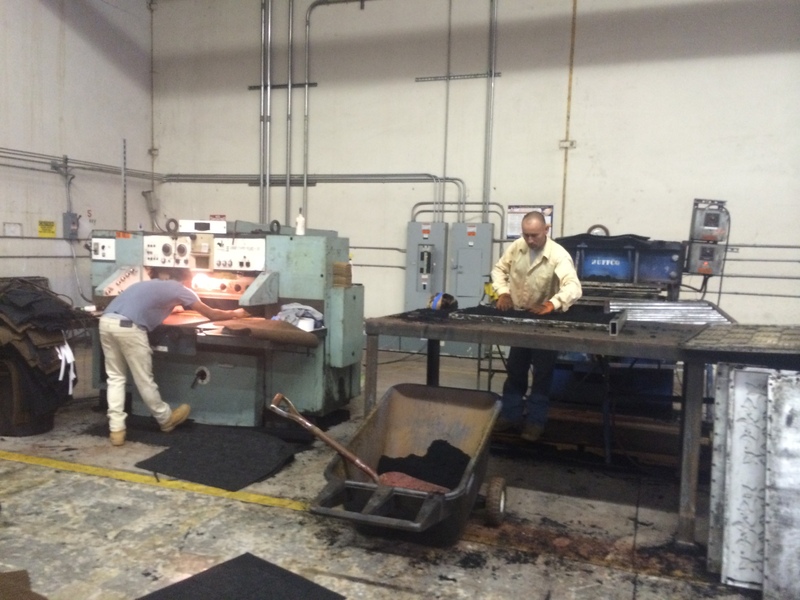 In addition, Sierra Mat & Rubber in Modesto became a new processor of Double GreenTM products that include both California recycled rubber and carpet backing material. American Fiber Cushion (AFC) also has expanded its Tier I processing operations in Georgia. AFC is also considering a new plant in California. If approved, the plant would be operational some time in 2018. Under the Product Testing grants program, GHD Inc., in partnership with Humboldt State University, has submitted a draft feasibility study examining PCC’s physical properties for civil engineering applications. At the end of 2016, grantees under the Capital improvements program had generated approximately 14 million additional pounds of recycled output, increasing total annual recycled output by 50 percent for 2016. Unfortunately, these gains were negated by a significant drop in recycled output by two other processors due to market and technical issues for their operations, but points to the potential increases in future years as facility operations rebound. In 2017, these grantees are expected to add tens of millions of pounds of additional recycled output. As a result, these projects have created 14 new California jobs in 2016; dozens of new recycling jobs are projected in 2017. Under new Capital Improvements grant projects, a total of 10 new products were created, with an additional seven in progress. Completed products include carpet pad, shelving, toolboxes, ramps and transitions, landscape pavers and commercial mats. A copy of the 2017 products catalog may be found here. Information on Double GreenTM and other PCC products can be found here. The CalRecycle Buy Recycled guides can be found here. For more information on CARE grant programs, please contact Abbie Beane For more information on PCC-derived products and product presentations, please contact Mike Tinney.